Description: Maintain a healthy lifestyle with this mighty fruit infuser bottle. 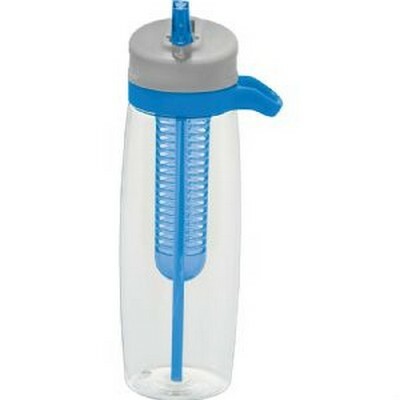 Screw-on, spill resistant lid with straw. Features: Detachable fruit infuser to add flavour to your breverage. Wide opening for easy cleaning and filling. Durable Eastman Tritan material. Shatter, stain and odor resistant. Carabiner hook. BPA free. 945ml capacity. Packaging: Polybag. Colour: Blue Material: Eastman Tritan Material Product Size: 260mm(h) x 80mm Ø. Freight details: 24 per carton, 4.6kgs, 56 x 38 x 29cms; Decoration Type(s): Colour Print / Full Colour Print . Decoration Area: Print: 45mm x 45mm. See drop down menu for decoration options.